Michigan legislators approved hundreds of millions of dollars for road repair, but there's a process to getting construction started. (WXYZ) — Michigan legislators approved hundreds of millions of dollars for road repair, but there's a process to getting construction started. Thanks to a grant from Planet M, Detroit has a new technology partnership, using artificial intelligence to help to get repairs in high gear. There are roughly 2,600 miles of paved road the city of Detroit needs to maintain. Ask anyone who lives or works here and they'll tell you, many are crumbling. That's why Roadbotics created an artificial intelligence program utilizing video from a cellphone to help get a better picture of what the road really looks like and using those images to assess the entire roadway system. The cellphone can be placed in a windshield and all someone has to do is drive the streets to gather detailed data. “We've done this now for 96 cities in 17 states and 3 countries so our system is quite good,” says RoadBotics CEO Mark DeSantis. The Roadbotics program analyzes the video and detects signs of road failure. “Things like ‘Block Cracks,’ ‘Edge Cracks,’ ‘Alligator Cracks’ and a variety of features, among them would be potholes but there's a lot of other things we look for as well,” says DeSantis. Something like an alligator crack is a sign that the pavement is about to cave. Detecting those could help repair roads before potholes appear. That data collected from the video is used to create a map, color coded with 5 levels. Green, level 1, indicates a new road. On the other end, level 5, red, is a street in urgent need of rehab or repair. Engineers can zoom in to take a closer look at the exact problem. “They have not only the scoring and the assessment itself, but also images of the problems that are giving that score,” says DeSantis. That level of detailed analysis helps city leaders figure out things like budget and which roads to repair when. 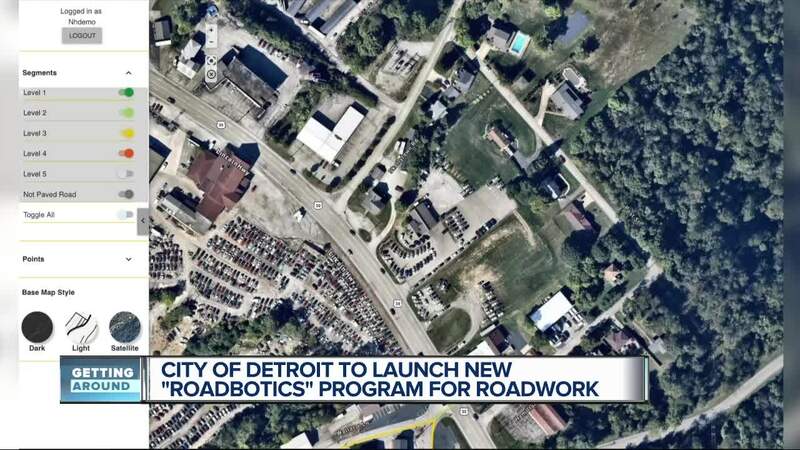 DeSantis says when the winter weather is over, he and his team will be driving Detroit streets and putting Roadbotics into action for the city.